An upright Campanula with clustered bell-shaped deep violet-purple flowers on top of sturdy stems. Plants flower from June to August and grow to a good 60cm in height. These are great border plants, looking best in groups, and showy cut flowers. These plants have the Award of Garden Merit from the Royal Horticultural Society. 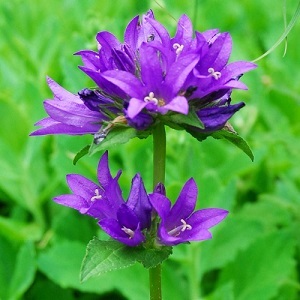 Clustered Bellflowers grow best in full to part sun and fertile well-drained soil. These plants come originally from Russia and are very cold hardy. Pack of approx 1000 seeds. Sow in spring to autumn. Flowering generally starts in the second year, but may start in the first year from early spring sowings. Sowing instructions and a colour photo are printed on the packet. Conditions Grow in full sun to part shade and fertile well-drained soil. Sow in spring to autumn on the surface of a shallow tray of seed compost. Do not exclude light which helps germination. Keep at 15-20°C and seeds germinate in 1-4 weeks, sometimes longer. Transplant seedlings to pots when they are big enough to handle and into the garden after the last frost. Early spring sowings may flower in the first year. Protect young seedlings and shoots from slugs and snails. Cut back after flowering to keep a good shape, and there may be a second flush of flowers. Plants die back in winter and regrow in spring.